Turtle Moon Studios: Susan Shie. Turtle Trax Diary 2-11-98. Leo Full Moon Over Wooster with Aquarian Sun!!! Four tiger women at the Year of the Tiger New Year's Party. 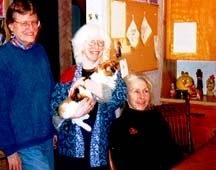 From left: my across-the-street neighbor Dee Perley, me and my 19 year old crone-cat Maggie, and my tiger birthday-sister, Jane Bates. Yes, I know Maggie's astrology animal is not tiger, but she is a great cat, and Willy, who's a tiger-looking cat, is a boy, so he can't be part of a women's picture. 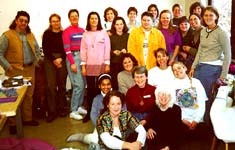 According to the 1998 We'Moon calendar, made by the neat women who run The We'Moon Web, this yellow earth tiger year should be wild and creative. A time of grand scales and extremes. Good. I get so bored when there's nothing to do! Being a white metal tiger, tiger of the autumn and the west, I am always excited and expectant when "my" year comes around, every 12 years. So we had a little party on Jan. 28, the Aquarian new moon and Chinese New Year. I invited several tiger girlfriends, including my birthday-sister Jane Bates, and Dee Perley, who're yellow tigers, so this is their BIG tiger year. Since they're so earthy, they don't make as much clang bang about it all, as I do. But somebody has to. We also invited non tigers, and celebrated the fact that next year will be our friend Laura Saeger's year, the Rabbit year. Then comes the Dragon in 2000. Look out! And then Jimmy's Snake year. So here's the rundown: The wonderful thing about tigers is tigers are wonderful things (and we scare away thieves, ghosts, and fires. Handy, aren't we?) Rabbits are gentle and cautious (and tasty. Yum.) Dragons are more scary than us tigers, so I have only praise for their bad selves. And Snakes, well Snakes are very capable of getting even while you're asleep. So we have only praise for their cunning bad selves, also. Besides, since Jimmy is a snake, and we're not supposed to be married, coz the Chinese think we're a terrible match, I think mutual respect is called for. I mean, we both have lethal bites, so better to bite midnight snacks than each other. I prefer ice cream, stirred up, with cocktail peanuts and Hershey's Malted Chocolate Dope, myself. That's tiger food: extremes. Yum Yum. I hope you're a tiger, too. We are so much fun. It's amazing how hard I can work when I'm in an avoidance frame of mind! 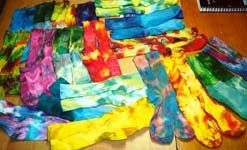 I scrunch dyed two dozen pairs of socks last week, taking time out from tax work. I'm not going to show you a picture of my beautiful studio all cluttered up with all the papers and books for number crunching for our tax accountant, Bonita. Surely you can imagine it and don't want to really see it. But do remember that I was suffering, and managed to drag it out for well over a week, bleeding pity from anyone I emailed, to make myself feel the martyrdom yet the more. Partway through totalling business expenses I cracked and just knew it was the perfect time to dye those socks I'd been talking about dyeing ever since last August's Turtle Art Camp, when Jan Cabral taught Jane Roberson and me how to do Ann Johnston's parfait low water dyeing. I blew it with the first dozen, whose cotton feet didn't take the dye as well as the elasticized cuffs. Cindy Litchfield told me they musta put iron into the fibers, to make them wear longer. So I got Jimmy to stop at the mart again, and this time I managed to buy socks that worked well with the dye. So now I'm sending presents of socks! My niece Julie Shie got four pairs for her sweet sixteen birthday in Florida. Jimmy's sister Karen and Elizabeth Owen got some for their birthdays, too. So now there will be all these Aquarian babes running around in colorful cloud-looking socks. How appropriate for an air sign. This is a detail of the finished (for now) quilt we made and donated to Hospice of Wayne County. It has room for about two more years of their timeline history and can have more name panels made and attached to the side borders. The eyes of the turtle are brass scrubby pads, a spark of genius of Anne Warren's, when we were shopping at Dollar General together last year! Monday we installed the finally finished Hospice Quilt, which they had asked us last June to make as a donation for their new building. I started it at a Summer Solstice ceremony, painting on a sheet of white fabric by firelight in the woods at Mady Noble's house. The quilt became much more elaborate than we originally thought it would. I sat many a night in our Love Shack apartment in Alfred, NY, embroidering names of donors and sewing on buttons. Guess it kept me from being a wild woman there. Jimmy worked for a long time on the tooled leather top arch, a replica of this Hospice's logo, a live oak. The quilt would hang at Hospice off and on, between the new building's August 11 opening and now, but is now there to stay. I hate to admit it, but I actually forgot to take overall snapshots of this quilt. So as soon as the slides are back, I'll replace the detail with a full shot. For now, picture a big turtle with lots of writing around it and a bunch of name panels on the sides, and a gob of buttons. OK, hold that thought. The turtle is able to always be at home, right? And that's Hospice's mission, to help people die in dignity, in their homes. All the big blue eyes on the quilt are soul eyes, the eyes of love. 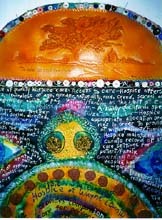 And the terra cotta clay faces around the edge of the turtle shell stand for many helpers, and for many who have died with Hospice's assistance. We dedicated the quilt to the memory of our dear friend and quilt artist Luanne Moffett, whose death in 1991 was truly made easier because of this Hospice chapter. 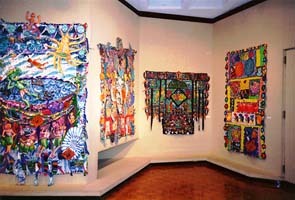 This is a shot of the beautiful gallery Joyce Koskenmake hung our solo show in, at the University of Wisconsin, LaCrosse, Jan. 15 - Feb. 6, 1998. There were 41 pieces of our artwork in the show. In the middle of January, Jimmy and I flew to LaCrosse, Wisconsin, for the opening of our solo show at the university, and to teach a workshop in conjunction with it. We had a wonderful experience, thanks to Joyce Koskenmaki, the gallery director, drawing professor, and quilt artist. Not only did she and her assistants hang the show in an exquisite way, but she organized a workshop of 25 students, all eager to work and learn. We had a nice amount of snow there, which made up for not having any in Ohio, and Joyce took us around and showed us the sights of her city. We even got to go up on top of Granddad Bluff and look down on the city below. This is most of our group for the workshop in LaCrosse. Some had left already, and Joyce, who also took the class, was behind the camera. We were making small diary quilts, using women's tarot cards and Native American totem cards for inspiration. And some of us took time to work on mermaid dolls. And to compare astrology charts. And to set up one student's medicine wheel. It was a nice and loose group of creative spirits. 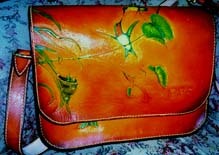 Here's the Hummingbird leather handbag Jimmy made as a Christmas order, now in the collection of Delores Stevens. After I finish this diary entry, I'll be over at Jimmy's web site, adding updates to his catalog pages, like this bag and some now fly fishing cases. He's not ready to learn HTML for a long time yet, but he is slowly learning about email and is doing the typing tutorial I used last year to learn to touch type. This guy will someday be a real computer nerd. Well, probably not, but he will answer all his own email someday! 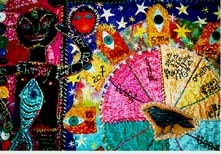 Marykay Yannotti commissioned us to make a quilt as a biography of her in 1996. It contains her astrology chart, which I set up and then made into a section of the quilt. We've put charts into our quilts for years, and I've never thought about teaching quilters about astrology until now. Must be all these planets transitting Aquarius! We're adding a new class description to the offerings we have here on the web site. David Walker gave me the courage to do this, when he told me he's going to offer a tarot quilt class! Ours will be "Stitching Your Stars: The Astrology Chart Quilt." It will not be about fortune telling, but rather will show you another way to learn more about yourself. I've been a serious astrologer since I was 15, thirty two years ago.....there is depth to getting old! And nerve! I already wear the color purple, so my show of strength is to come out of the cosmic closet! In the class, I'll set up charts for the students and explain how a chart is made and what all the squiggles and little pie slices stand for. The students will learn our basic Lucky Ways of Quilting as they find out more about themselves, and will come away with more understanding of a noble profession that's had a bad rap! Let us know if your group wants to have us come and teach. Have moola, will travel, I say! We're getting ready for a Turtle Art Camp here, Feb. 18 - 24. Everyone's gearing up for the astrology quilt guinea pig experiment and whatever else we decide to do impulsively, as usual. Also, we'd love to have someone propose to come to a Turtle Camp here any week between mid May and mid June, and any week this Fall. Just let us know when's good for you, and we'll open that up to other campers. When it comes to hanging out at Turtle Art Camp, nothing can compare with the delights of the two camps this July 21 - 27 and July 29 - August 4, with the lovely arches of the Rainbow Garden to wander in, while we're on break from making art all day and night. Sign up now and join a summer class ! !